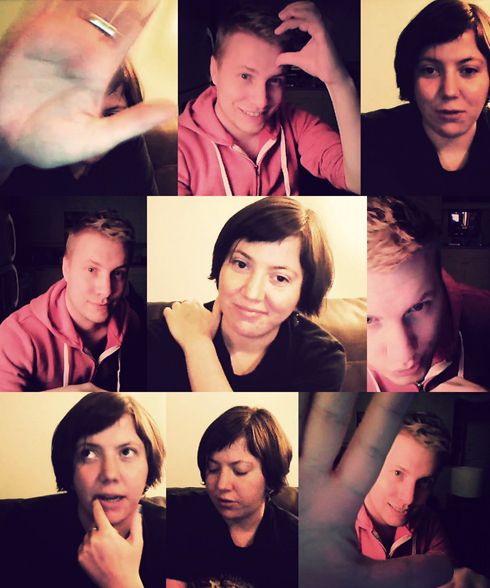 I have to admit that I love taking unsuspecting pictures of people while chatting with them on skype. I realized just how apparent my fascination was when I looked back at my library of screenshots after catching up with Wendy on Thursday night. The last few days have been kind of a blur and having not talked with Wendy on a one on one basis in a while, it seemed like the timing was right. The death of my grandma early in the week couldn't have come at a stranger time if I'm honest. It was only a few weeks from now just last year that my friend Dave passed away, and with the preparation I've been doing with my Searching Salvation project, having another funeral for someone I was close to just seemed to further engage some emotions that were already resurfacing. It was nice to connect with Wendy, not just because of Dave, but because at this point it feels important to me to me to help move the conversation forward without constantly dwelling on the past. Wendy and I discussed everything from Darwin's 1st birthday to personal projects, relationships, and what the future of the old Regina-crew might look like. The weird thing that hit me during our conversation was that Wendy was actually filling a role that Dave used to play for me. It was nice to be able to bounce ideas and thoughts around with someone who could relate to a lot of my feelings at the moment. I think we're well on our way to a new beginning.